'In Focus: Women of Board Gaming' is an exclusive series from Punchboard Media that spotlights women in all facets of the board gaming industry. Our guest this week is Claire Donaldson, the artist for many board games, including Best Treehouse Ever: Forest of Fun, Go Nuts for Donuts, and Food Truck Champion. The interview was conducted over email by Eric Buscemi. Claire, thanks so much for taking the time to talk to us! Before we talk about the illustrations you've done for a number of board games, do you like playing board games? If so, what are some of your favorites? I do like playing board games, but I didn’t realize that until I moved to Seattle a little over a year ago. At that point, I began to do a lot of illustrations for Daily Magic Games, while simultaneously making friends who like to play new games almost every week. One of my favorite games is Dominion, and a second favorite that I’ve only gotten the chance to play twice is Century. I think that one’s a lot of fun to react to, as I’m not great at long term strategy. Have you played the games that feature your artwork? If so, do you have any favorite games to play of the ones you've illustrated? I almost always get the chance to play test the games that I illustrate. There are a few exceptions, sometimes there just wasn’t time, and other times I’ll playtest the game early on in its development, and by the time its published it feels like a completely different game. But playing them, even early on, really helps me feel connected to what I’m creating. A few of my favorites are Go Nuts For Donuts because its a beautifully simple concept, easy to explain, but actually has a lot of potential depth. I’m pretty bad at that game, but I have so much fun making the donuts that I don’t even care. Another favorite of mine is Food Truck Champion. Nicole Jekich and Luke Turpeinen designed it, and it's one of my favorites. I’m not sure I can describe it properly, but let's just say I got to illustrate tons of delicious food, and I’m excited to get my backer copy! What is your artistic process like? Do you work on paper, digitally, a combination of both? I love to work on paper, but I just haven’t developed a process that I think is consistent enough or practical when I have to make upwards of 50 separate illustrations for a game. I think working digitally is exciting, and very freeing, but I suspect a lot of illustrators agree that getting your hands on a physical medium provides an extra little rush. So I try to work with paint and paper in my own time, because I think it can be a good way to ground my digital work too. You've done a lot of work with Daily Magic Games -- including Alchemea, Food Truck Champion, Go Nuts for Donuts, and Kitten Klash. How did your working relationship with them start? What's it like working with them? I got started working with them when I realized their office was less than a ten minute walk from where I lived at the time. So I walked into their office. They were looking for graphic design help at the time, but they ended up using me more as an in house illustrator. It’s fun working with them, because they really care about making their games look good, but they also keep to a fairly hands off approach once the work begins. I like being able to put my nose to grindstone, and just draw, so working out a process with people that lets me do that is great. For the game Crabs, you are listed as one of two artists, along with Hitsukirei. How did the art responsibilities break down for that project? So, Crabs was a game that DMG picked up, and they wanted to expand and refine what was already there. I’m pretty good at working in different styles when it's called for, so when they wanted to redo the card backgrounds, crab catching tools, and add a whole line of crab vendors to the game, that's what I got to do. Pretty much as soon as DMG started working on the game, it became my job to change or add to the visuals. I even got to try my hand at making a Kickstarter video, which was fun. I don’t often get much opportunity to play in Aftereffects. You recently did the artwork for the Best Treehouse Ever: Forest of Fun expansion. The artwork for the original game was done by Adam McIver, but your artwork complements it perfectly. Is it hard to come in and match another artist's style like that? No, not really, but I think its easy to forget that what makes a style valuable isn’t the process that goes into it, but the experience of the artist that led to that process, and the art direction that understands where to apply it. I do get a little nervous about it, only because it’s rarely recommended that a young illustrator try to beat another professional at their own game. Mimicry definitely invites direct comparison. What I try to do is treat it like a master study, and make something practically applicable to the project. In this case Adam McIver provided me with a list of the brushes he used, and I had access to the original layered PSD files. I really admired how organized they were. Anyway, it can be difficult, and it can be frustrating if you don’t feel there’s still a creative outlet in the work, but I always go back to the purpose of the illustration, because that’s ultimately what I’m trying to serve. The style of his work really matches the game, and when I’m trying to mimic an art style, I want to respect that. In this case, I was given the resources I needed to match the style easily, and I found a creative outlet in stuffing treehouse rooms with awesome impossible things, like a roller coaster. Do you prefer doing larger art pieces like box art, or working on smaller pieces like individual cards? So far I like working on cards, because it feels like I get to explore an over-arching concept through lots of separate illustrations. But there’s also something really exciting about getting one shot to make an impression, and have it really suit the game. What are the timelines like working as an artist in the board game industry? How long do you have to create the different artwork assets? It changes, but I try to keep it under three hours for a card, because you don’t want to limit the scope of their game because of their budget. Honestly, I always felt a little too slow, so I’m constantly pushing myself to make the work faster. It's nice to slow down and finesse the work for something like a box cover, but I didn’t time myself as carefully when I worked on those. I do like to tell myself that I can get any amount of work done in two weeks. Just sit me at my computer and leave me to my fate. What are some of your favorite illustrations from all the games you've worked on? Oh boy, you’re putting my false modestly to test with this one. Well, I really love some of the illustrations I did for Alchemea, because I got to play with illustrating alchemical experiments. I feel I would have made a very good scientist if I were born in a time before we really cracked the whole scientific method. I suspect it would have looked a lot like art. 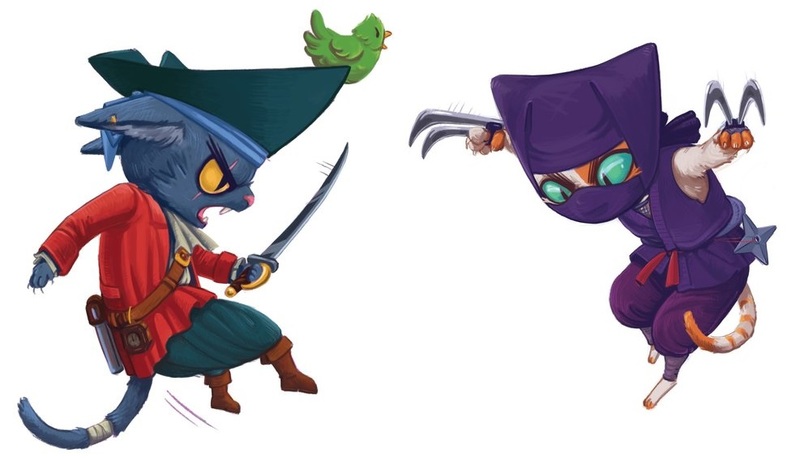 I also cannot deny the power some of those cute donuts from Go Nuts For Donuts have on me, and I will always love the pirate kitten from Kitten Klash. I don’t know, I’m surprisingly pleased with a lot of the work I’ve done. I still have a lot of things I’d like to improve on, but I try not to waste too much time worrying about work that’s finished. I want perfect what’s next. Hmmm... the timeline for some of the games I’ve worked on so far is a bit of a mystery to me. There’s a pretty swanky looking chocolatiers game I worked on recently that should be headed towards Kickstarter soon, and a beautiful bird themed game I made a few additions to. All of this was with DMG, so if you follow them or me on Instagram, Twitter, etc, you’ll catch wind of something. I personally plan on upping my web comic production this month, and I’m about three suits away from a full deck of hand painted tarot cards. If you’re into any of that, stay tuned. Forever and always. I’ve worked pretty exclusively with DMG for the past year, and I’m currently trying to branch out. I’d especially love to play in some new genres. If anyone wants to contact me regarding potential commissions, the the best way is to email me at iclairedonaldson@gmail.com. Is there anything else you'd like to tell us about? Any hobbies or passions? This was not a prerequisite to all the food themed games I illustrated, but I love to cook, especially when I get to experiment. I almost like baking more than I like eating baked goods. Almost. I love to play tabletop RPGs. Oddly enough, I haven’t gotten the chance to illustrate one yet, but man do I love playing them. I’m currently playing as a prim Warlock and a heavy metal Half Orc in two different D&D 5E games, and a morally challenged Nautolan in a Star Wars: Force and Destiny game. Other hobbies include loving a big dumb poodle named Cooper, coming up with agnostic pagan rituals, and loitering at the central public library. That’s the best self summary I can manage, but I guess if you want to see more of my work, you can find it on my website at clairedoesntlaugh.com. Thanks for the questions!